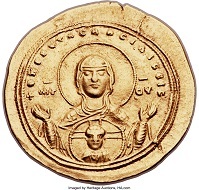 February 7, 2019 – The price of the presumably most expensive Byzantine coin ever sold in a public auction was five times higher than its pre-sale estimate. The gold histamenon from 1042 changed hands at the Heritage Long Beach Signature Auction 3035, which took place from September 3 through September 5, 2014, for 190,000 USD. This gold histamenon from 1042 was sold by Heritage Auctions. Photo: Heritage Auctions, HA.com. 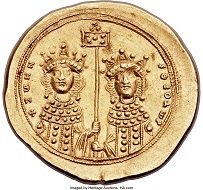 The reverse of this record-setting piece features two Byzantine empresses. Zoe on the left and her younger sister Theodora on the right. The two daughters of Constantine VIII jointly ruled over the empire for a mere seven weeks, namely in the spring of 1042. Their joint reign was not very successful. Zoe is generally described as power-hungry and voluptuous, while her sister is considered more reserved and austere. That was not the best basis for a successful partnership. When Zoe married Constantine IX on June 12, 1042, he took over the throne. As experts, Andreas Sommer and Alan Walker were asked to verify this record on February 7, 2019. Both confirmed this record on the very same day. More information about Heritage Auctions is available on the official website. The Encyclopaedia Britannica tells you more about Zoe and Theodora.